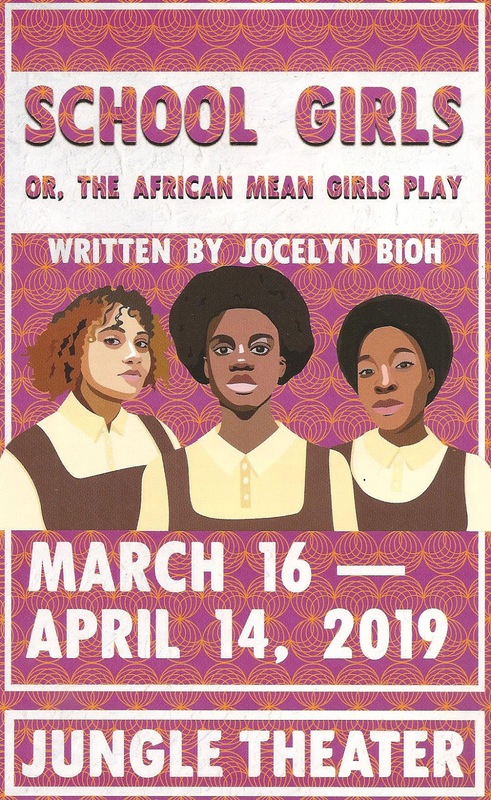 On the heels of the remount of the 2018 hit The Wolves, Jungle Theater brings us another smart, funny, touching, nuanced portrayal of teenage girls in the new play School Girls; or, the African Mean Girls Play by Ghanaian-American playwright Jocelyn Bioh. But this time instead of American soccer players, the girls are students at a prestigious boarding school in Ghana. Although their lives growing up in West Africa are likely very different from most of you reading this blog, their emotions, struggles, triumphs, and dreams are the same. In a very fast 70 minutes, we get a glimpse into these girls' lives as they deal with family pressure, poverty, bullying, competition, colorism, and problematic standards of beauty. Like in The Wolves, they're all fully formed complex humans that I'd like to spend more time with. It's the second week of the new school year, and this group of five friends is acting like teenage girls anywhere - chatting about boys, music, homework, and fashion. Paulina (Ashe Jaafaru) is obviously the leader of the group (played by Aishé Keita, Kiara Jackson, Nimene Sierra Wureh, and Salome Mergia), exhibiting subtle and not so subtle control over the other girls, despite the attempts of the stern but kind headmistress (Ivory Doublette) to intervene. Into their midst comes American-raised Ericka (Eponine Diatta), finishing out her schooling in her father's native country. Suddenly the power dynamic shifts, as the girls are fascinated by Ericka's clothes, make-up, and lighter skin color, setting up a rivalry between her and Paulina. A rivalry that culminates when a Miss Ghana recruiter (Hope Cervantes) arrives to scout for the pageant and is also charmed by the light-skinned Ericka, believing that she'd have a better chance in the global pageant. In the specificity of the lives of these Ghanaian young women in 1986, there are universal truths about the world we live in today. Director Shá Cage does fine work with this short but dense script, and this ensemble of eight women of color is just fantastic. From where I was sitting in the back row of the theater, the women playing the students all looked 16, although closer up and in street clothes one can tell they're fully grown women. But they all make convincing teenagers in all their complexity and contradictions (special kudos to Ashe Jaafaru for making us hate and love Paulina, her mean girl persona covering hurt and insecurity). The girls' performance of Whitney Houston's "Greatest Love of All" is a thing of awkward beauty, each a delightfully terrible singer in her own specific way (it takes talent to sing that badly). These characters all feel so specific, real, and relatable. 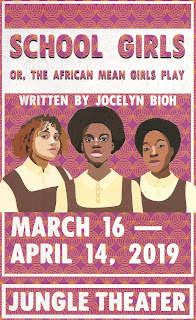 Thanks to the Jungle Theater for continuing to bring us new plays, especially ones by new exciting voices that we need to hear; stories about women, about people of color, about people in other countries who live lives very different from our own, but with whom we share commonalities of being human. 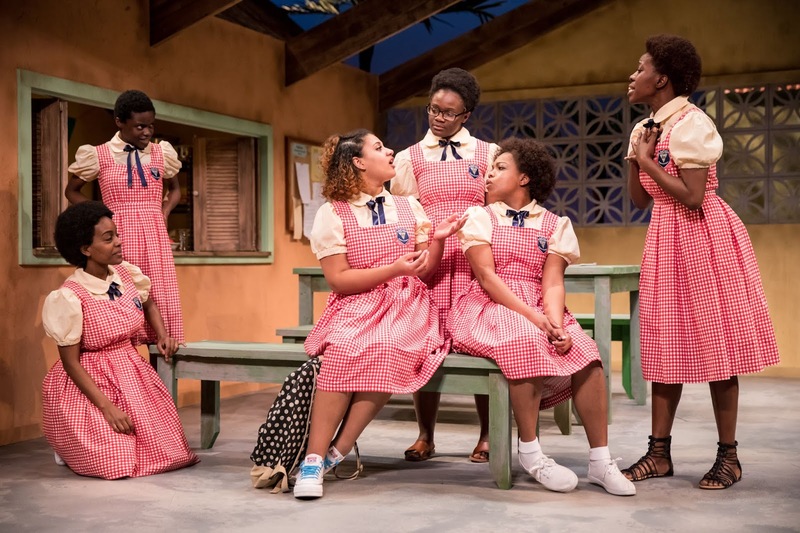 School Girls; or, the African Mean Girls Play continues through April 14.